Set into a rocky cliff overlooking the Gulf of Naples and surrounded by lush, centuries old gardens, the distinguished Grand Hotel Ambasciatori certainly has the wow factor. Dripping in traditional Italian opulence, it’s full of cool tiles, high ceilings and refined finishes. The hotel is owned by the Manniello family, who have fiercely protected the stunning original features through the generations, while still ensuring some aspects evolved to meet the needs of the 21st Century traveller. So expect sophistication around every corner, with subtle modern comforts. The grounds are equally as beautiful as the building. The palm-lined pool glows like a turquoise gemstone. The ornamental gardens offer a slice of perfect paradise. 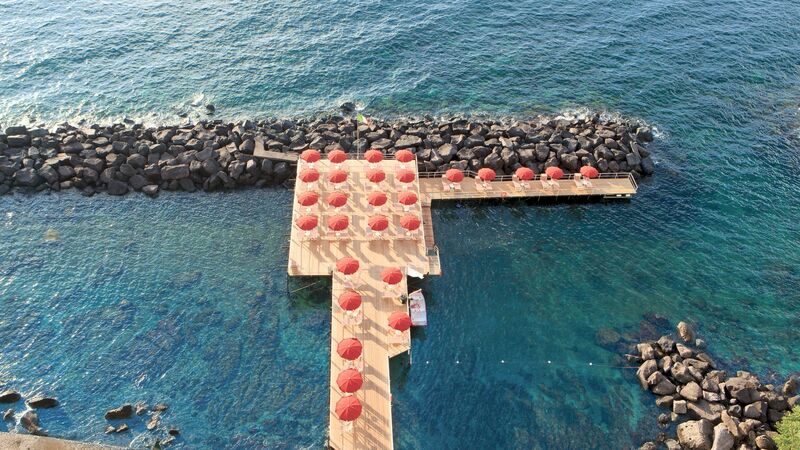 The private bathing jetty, lined with chic loungers and parasols stretches into the sparkling waters of the Mediterranean Sea. Beyond the tranquillity of the hotel, you’ll find the lively town of Sorrento. The main plaza is only a short stroll away and offers an array of local bars and restaurants. Do you appreciate incredible food and incredible views? Well, you’ll love this spot. The Executive Chef has a unique and remarkable ability to transform the simplest of ingredients into culinary masterpieces, offering diners a complete sensory experience. Enjoy an unforgettable evening with a loved one at this intimate dining venue. As well as exquisite food, romance is also on the menu on this candlelit cosy terrace overlooking the magical Vesuvius Volcano. If you’ve got a sweet tooth don’t forget to ask about the desserts. Once you arrive at Afrodite, be sure to get comfortable and settle in, because you won’t be leaving for a while. 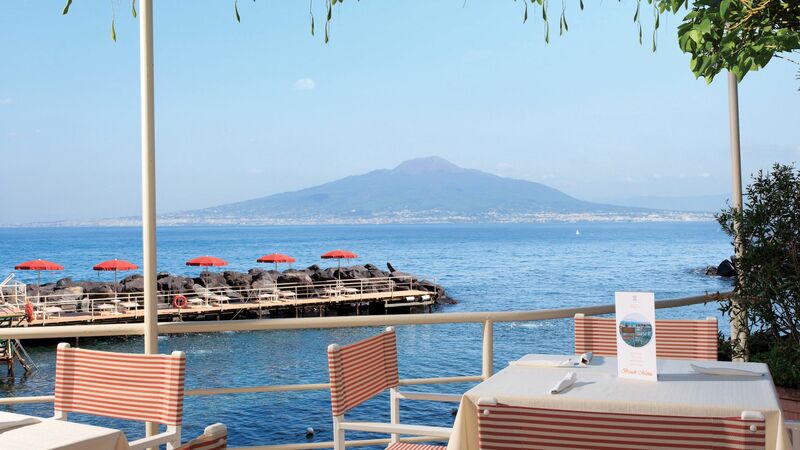 With the incredible panoramic views over the Gulf of Naples, friendly staff and impressive cocktails on offer, you will be sucked into this chilled, charming atmosphere and the hours will pass before you know it. Relax with a cool drink in a warm and friendly atmosphere in this pretty bar right down at the water’s edge. 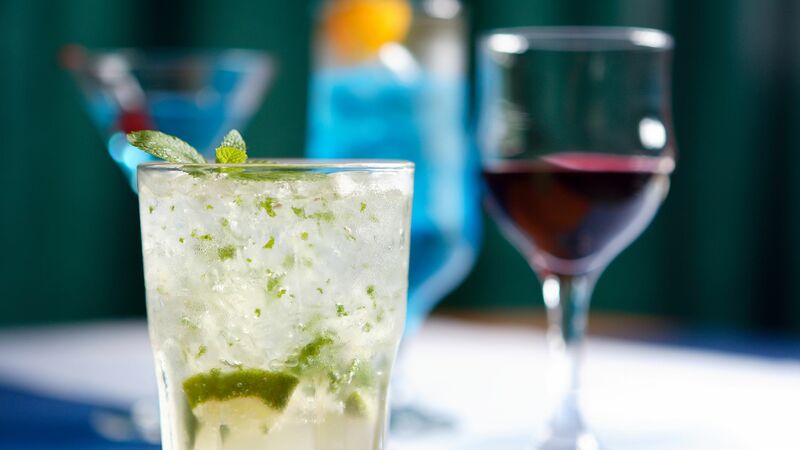 The bartenders are excellent mixologists and will be more than delighted to shake you up something special. Spend an evening enjoying cold drinks and sizzling meat or fish straight from the barbecue at this informal eatery. Everything is cooked fresh to order right in front of you by the specialist grill chefs. Feel at one with the sea on this trendy private jetty that stretches out into the Mediterranean Sea. The space is lined with luxury loungers and parasols and staffed with attentive serving staff to cater for your every need. This greenery lined pool is the perfect place to relax with a good book and a cold drink. Being located high up on the cliffs mean that you’ll enjoy beautiful views and a light Italian breeze. 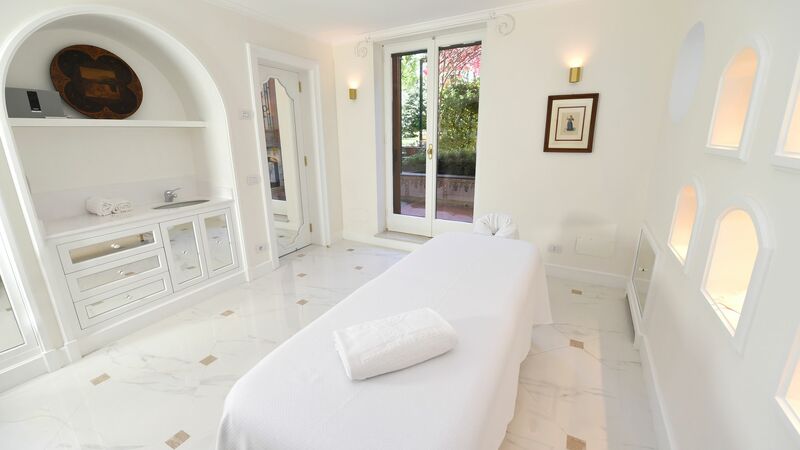 Be prepared to be pampered at the luxury La Villa spa. With the soft lighting and tranquil atmosphere, you’ll start feeling relaxed the second you cross the threshold. 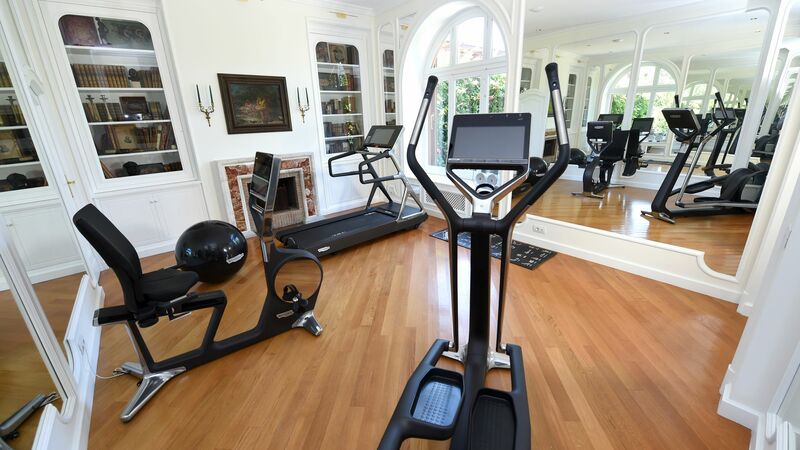 Burn off some energy and build up some strength at the Grand Hotel Ambasciatori’s state of the art gym. As well as featuring a host of cardio and weight equipment, an onsite team of trainers offer a range of fitness classes from yoga to bootcamp. From jazz to contemporary, you can indulge in some live music down by the pool twice a week. Featuring local talent, you’ll be sure to get in the mood to dance the night away. Whether you want to practice your backhand or have a game, the tennis court is open exclusively to guests all year round. 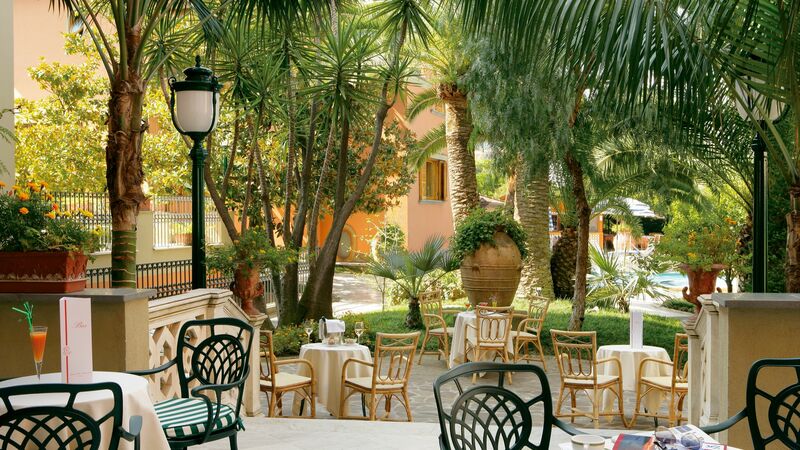 Grand Hotel Ambasciatori is just minutes away from the centre of Sorrento, along Italy’s Neapolitan Riviera. Built into luscious green hillsides and full of colourful buildings and a thriving port full of little boats and luxury yachts, this is the place to enjoy the glamorous side of Italy. Explorers can head to the thriving town of Naples for the day, or climb to the top of iconic Mount Vesuvius. If you prefer to simply relax, wander through the cobbled streets of Sorrento, enjoying a coffee or gelato in street side cafés or ducking into the excellent eateries of the town. Climbers will enjoy the designer boutiques, while culture lovers can visit the 11th Century church. Grand Hotel Ambasciatori is an hour and 30 minutes from Naples Airport. Twin Rooms are decorated with warm colours in a classical style. The woodwork is hand carved by local craftsmen exclusively for the hotel. Facilities include a balcony overlooking the hills of Sorrento, individually adjustable air conditioning and heating, telephone, satellite TV, complimentary Wi-Fi, minibar, radio and safe. Bathrooms feature a bathtub, hairdryer, magnifying mirror and bathroom amenities. Twin Rooms with Balcony feature views of the garden and are decorated with warm colours in a classical style. The woodwork is hand carved by local craftsmen exclusively for the hotel. Facilities include individually adjustable air conditioning and heating, telephone, satellite TV, complimentary wifi, minibar, radio, safe, hairdryer and bathtub. Twin Rooms with Balcony feature parcial views of the sea as well as views of the hotel grounds. Rooms are decorated with warm colours in a classical style. The woodwork is hand carved by local craftsmen exclusively for the hotel. Facilities include individually adjustable air conditioning and heating, telephone, satellite TV, complimentary wifi, minibar, radio, safe, hairdryer and bathtub. Junior Suites are spacious with panoramic views of the sea, the entire Gulf of Naples and Mount Vesuvius from the balcony. Facilities include individually adjustable air conditioning and heating, telephone, satellite TV, complimentary wifi, minibar, radio, safe, hairdryer and bathtub. Open Plan Suites have been recently renovated and offer a large open plan bedroom and a balcony overlooking the sea. Facilities include individually adjustable air conditioning and heating, telephone, satellite TV, complimentary wifi, minibar, radio, safe, hairdryer and bathtub. Single rooms have a single bed, balcony and bathtub. Facilities include individually adjustable air conditioning and heating, telephone, satellite TV, complimentary wifi, minibar, radio, safe and hairdryer. Rooms are available without a balcony. Guests who book a Twin Garden Room will receive a free upgrade, subject to availability, to a Twin Garden View with Balcony. Guests who book at Twin Garden View with Balcony will receive a free upgrade, subject to availability to a Twin Partial Sea View. This offer is valid for holidays between 01 - 11 April and 11 - 31 October when booked by 31 October 2019. 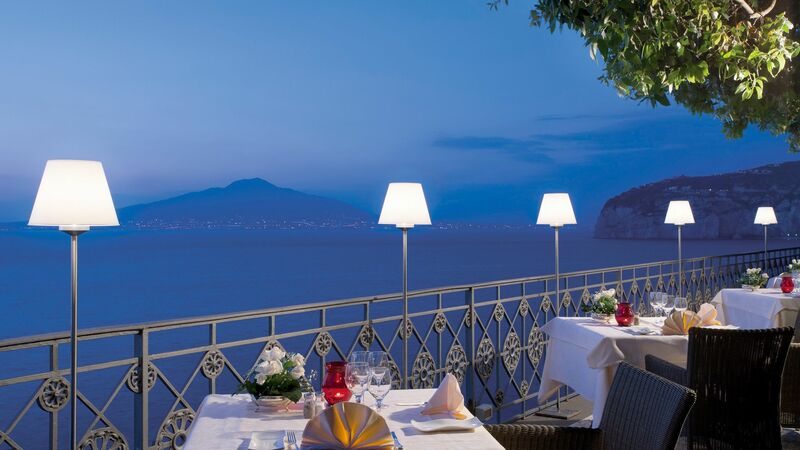 Guests will receive a 10% discount at the Il Parruchiano restaurant in Sorrento for holidays between 01 April - 31 October 2019.
allover the hotel was perfect. 10 minutes by walk to sorrento main square and port. the view from room balcony was astonishing, restaurant was very good. the staff was very helpful and nice. it is quite nice experience. We stayed for 5 nights in early April and loved this hotel The room was very spacious with a balcony and beautiful view of Mt Vesuvius and the bay. The grounds were magnificent, like walking through a lush park with lemon and orange trees, cactus and flowers. It was an easy, scenic 10 minute walk to the city center. The food was delicious, beautiful views from the restaurant, great breakfast including made to order eggs and crepes. The staff was very friendly and helpful. Had the best facial of my life at the spa with Marianna. It was a little too cold to swim but there is a lovely pool area and a beach area on the lower level. Overall an amazing hotel. “ Expensive but worth it. Beautiful hotel in a fabulous location. About a 10-15 min walk into town or to the wharf to catch a ferry to Capri, but walking is great when the food is so good. The breakfast in the main dining room was amazing and the view to die for, you could almost just spend the whole day there watching the boats on the water. Loved the private beach, always an assistant to help with a lounger, towel, snacks, drinks etc. The pool was also really good with a great open spa. We had dinner in the restaurant one night and it was also very good. This hotel really makes you feel very special. The staff were very friendly and helpful, the views to die for. We enjoyed our stay at Grand Hotel Ambasciatori and would love to return to Sorrento and stay there again. The rooms are large with good views, the breakfast is outstanding and the restaurant (also used for the breakfast area) has incredible views of the Bay of Naples. Excellent service from everyone in the hotel. Hope we can come back soon! What an experience!! From the minute you walk in reception, the style and class of this place is undeniable. Take photos by the pool and the amazing gardens and grounds, take a hike down the stairs to the private beach. 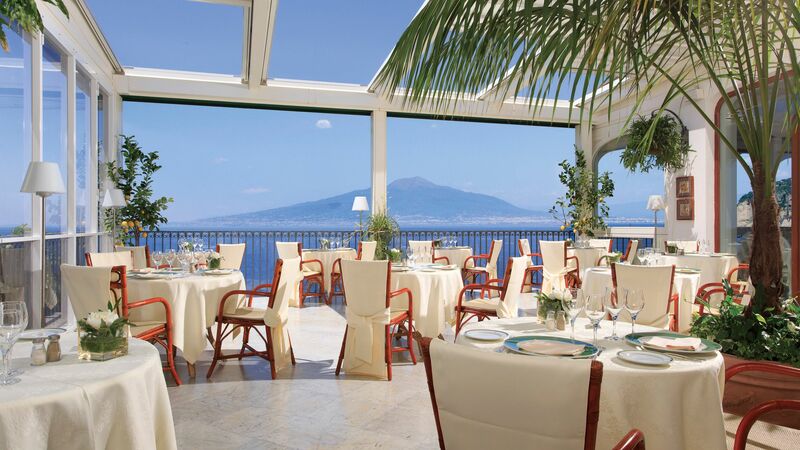 Buffet breakfast is very impressive, enjoy lunch/dinner on the balcony and take in the view of Mt Vesuvius. Price is reasonable for the area and quality - definitely worth it.